Trump Moon base and lunar mining mission to be announced? Trump to Announce Human Moon Base Mission and Lunar Mining? Trump wants humans to return to the Moon to set up a base and start lunar mining, according to multiple sources. This is a welcome departure from President Barack Obama's policy, which in 2010 terminated and abandoned President George W. Bush's program which had a goal of a human return to the Moon and establishment of a permanent outpost in the 2015-2020 time frame. President Obama infamously justified the cancellation of the ongoing work because, as regards the Moon, "we've already been there". That's about as stupid as if Christopher Columbus had been told by the king and queen of Spain that there would be no return to America because they had already been there, and so the next trip will go to the South Pole. The plan of the Trump Administration is even better than President Bush's Vision for Space Exploration Bush_NASA because Trump plans to engage the private sector to take over as much as it can, whereas the Bush Administration followed the same old traditional government contractor centered programs which are slow, inefficient, expensive, risk averse, and sometimes corrupt. The property mogul surely appreciates the importance of private property rights on the Moon, and the development of real estate there. President Trump has already met with leading private sector entities for commercial development of the Moon, who were invited to the White House to discuss these matters. The Trump Administration has some key advisors and personnel who are proponents of the utilization of lunar resources for space industrialization and human colonization. Asteroids near Earth, the focus of some other private sector entities (such as Planetary Resources, Inc.), was mostly ignored as a next step. I have long been an advocate of focusing on the Moon first, moreso than asteroids, because the lunar poles have what we need, it is a relatively short trip to the Moon all of the time, we can plan with much more certainty about lunar resources, there are not any asteroid targets at this time which are clearly good (in my overall assessment), and there are too many unknowns and risks in dealing with asteroids. While asteroids may have more longterm potential, it's still too academic and idealistic. Of course, we've never had a human visit to an asteroid, so it would be new and novel, many asteroids may be more intriguing scientifically, and there may well be significant advantages to mining asteroids eventually, but from a practical standpoint, asteroids are not on the immediate horizon. Lunar development would make missions to asteroids and Mars much more economical, more technically feasible, and lower risk. The Moon is a stepping stone, too, but only after we have permanently settled the Moon with humans and established space based industry there. Along the way, Trump also wants to privatize low Earth orbit space station assets and stop the government from competing with the private sector, which is a major disincentive for private investment. NASA's role would focus more on technological developments which would assist commercial interests. Predictably, this has generated a big fight between "old space" and "new space", i.e., between expensive and entrenched old government contractors who are powerful interests with a lot of money, versus lean and efficient private entrepreneurial companies such as Elon Musk's Space X, Jeff Bezos' Blue Origin, enterprises by Peter Thiel, and others such as Planetary Sciences and Deep Space Industries (DSI). Trump has met Musk, Bezos and Thiel, to discuss the issues. According to reports, Trump understands the issues and is strongly favoring "new space", but this will be a tough battle in Congress. A proposal is being considered for a "space industrialization initiative" whereby NASA would be "refocused on the large-scale economic development of space". Later in February, Elon Musk announced that Space X plans to send two private astronauts around the Moon in 2018 inside its Dragon capsule. The "old space" competitor is the entrenched Space Launch System (SLS) consortium of Boeing and Lockheed, which was tasked with replacing the Shuttle with a heavy launch rocket, including the creation of a human capsule called Orion. Later in February, acting NASA Administrator Robert Lightfoot wrote that he would instruct the top NASA official for human spaceflight, William Gerstenmaier, to look into ways NASA could fly astronauts in a lunar orbiter called Exploration Mission 1 (EM-1) in November 2018, as reported in the Washington Post. WP-EM1-2018-11 The current plan was to fly EM-1 with mannequins in 2018, and humans not until 2021, at the usual NASA snail's pace, while they complain about needing the government's expensive financial commitment for consistency in employment over the years in between... with no sense of urgency otherwise. Elon Musk's focus on Mars has always been questionable in terms of relative cost, payback (unlike lunar and asteroidal resources), dependence on government / taxpayer money (aka "partnership"), timeline, and feasibility. Hopefully, this will get Musk to focus more on the Moon. The various other private sector entities who have focused on the Moon are now better positioned to engage with the new focus than those focused on asteroids, although proponents of asteroids near Earth will clearly benefit from this (as will Mars proponents later). Some big names are coming up, such as Bigelow Aerospace with their inflatable habitats, the extremely wealthy Jeff Bezos who is still working to launch things to orbit but has the personal commitment and the money to diversify into lunar infrastructure separately, and high level silicon valley investor Peter Thiel who has catered to Trump for a very long time, sticking with Trump through both good and bad times. However, lunar development will require a lot more people and companies with a much broader skills base than these big names, so we should not focus too much on just these few big pieces of the much larger puzzle. PERMANENT maintains a database of people and companies who have done research and development on lunar resources utilization to date, as well as projects and published technical documents. There could be an explosion of companies getting involved in lunar development and gaining investment. With the Google Lunar X-Prize coming to a head this year, it looks like 2017 will become a pivotal year for life from Earth to finally commit to moving beyond our planet in concrete (or lunarcrete) ways. No matter what you may think about President Donald Trump, and however his political career may turn out, this will almost sure become his greatest legacy, and stand out in the history of humankind. On the other hand, Trump's outspoken "America first" statements may raise resistance from non-Americans around the world who may feel that America is claiming the Moon and leaving them behind (wrongly, but it can be an emotional perception). Trump is very nationalistic, but it is hoped that entrepreneurs of other nationalities will respond to this space race. There is not much of a worry from other government programs, such as those of China and Russia, as they will naturally fail to keep up, but hopefully they might start to encourage their own private sector with incentives. It would probably be unrealistically hopeful to expect the leadership in those countries to have the courage to strip away a lot of the parasitic, arrogant, and pompous cronies in their space programs who limit and repulse entrepreneurs. (I hope I'm wrong, but afraid I'm right again on this issue.) China may continue with its 5 year "establishment" plans, and Russian experts may ride their nationalistic government gravy train instead of working with multinationals. The Chinese and Russians will probably progress at too slow of a pace due to their unwillingness and inability to handle their cronies, and may continue to believe in their own inner circle groupthink self-assurances all the way to oblivion. Multinationals, comprised of the most talented citizens of multiple nationalities, will benefit from talented people walking away from government programs, and could become the main competition to American nationalistic entities, in fueling the space race, as well as good strategic partners who by the diversity of their personnel can remain independent from undue control and influence of national governments. It is the hope of PERMANENT that private sector "citizen diplomacy" will transcend government power in space development, and garner the support of the world, instead of lunar and asteroidal resources being seen as "American property" with a predictable backlash. National programs also feed paranoia about potential military conspiracies. Multinational consortiums would verify on-site that's not happening, while also having space workers of multiple nationalities beaming back interesting progress to their own peoples in their own languages, thereby bolstering support. PERMANENT has always maintained a database of people from around the world who have been seriously interested in utilizing lunar and asteroidal resources, as well as a database of publications from all peoples, in anticipation of the time when interest in space resources starts to take off exponentially. The author of PERMANENT, having worked in the US government's space program in the 1980s, quickly saw that it is an expensive, inefficient, and crony contractor led "space industrial complex" which was mostly not interested in new ventures such as lunar and asteroidal mining, mainly just the same old establishment programs. Actually, the concepts of lunar and asteroidal mining were potential competitors to their gravy trains, and beyond the realm of expertise of most space contractors, since it was largely into mining and manufacturing. PERMANENT was created in response, to promote private sector utilization of lunar and asteroidal resources, and space industrialization. After 30 years, Trump's agenda is a welcome change in government leadership on space. A new focus on lunar resources by ANY government in the world is also way, way overdue. However, in the end, the development of space resources is naturally for the private sector, not governments, which is Trump's policy. Space resources development should not be called "an American thing" since the rest of the world, which is far larger than America, and totals far greater resources and investment potential, has its chances, too. Going further, space resources should not be a "national" thing for any country. It should not be America vs. Russia vs. China. It should be the realm of multinational companies. The U.S. has laws on technology exports, mainly the International Traffic on Arms Regulations (ITAR), which largely affects some rocket and satellite technologies, but it should not impact things like mining, manufacturing, and settlement of extraterrestrial bodies. Even if it does, it's not as if America or any other country has already developed the technologies or has any significant lead. The playing field is fairly level at the time as regards lunar mining, manufacturing, and human settlement. A multinational approach, using employees from many countries, instead of nationalistic proclamations, would be a lot smoother. Otherwise, there may be resistance to the perception that Americans will be staking claim to the Moon exclusively. It would be helpful to Americans, too, to avoid such a perception, so there's less resistance to American efforts. In any case, even if there is resistance, whoever develops the Moon should push ahead anyway, and it's good that we have at least one country willing to do so. Hopefully, other countries and companies will follow suit. "If you can't beat them, join them." We are all from the same species. When you look down on Earth from space, nationalism seems so egocentric and petty. Excessive nationalism will look the same to our future descendants when they look back on history. We need humans to be self-sufficient in space, so that if there is a disaster on Earth, such as a technologically engineered supervirus or synthetic biology agent or bioweapon which makes humans extinct within Earth's biosphere, at least intelligent life from Earth will survive in space. We need to think not of "America first" nor "national security" but instead "international security", as discussed long ago on this website. PERMANENT has no preference of nationality. Indeed, its founder and Director has lived outside of America continuously since 1994, and counts Americans as a small minority among friends and business associates. PERMANENT is here to help good people of multiple nationalities to get a piece of the action in space resources. If you're interested, please make contact with us. 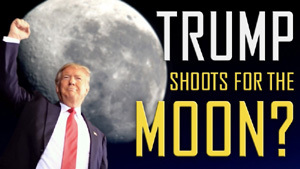 Source: POLITICO Trump team documentsPOLITICO obtained documents in February 2017 on Trump's planned Moon Base, commercialization of space, and redirection of NASA. Source: Exploration Mission 1 (EM-1)EM-1 is the planned first test of the NASA Space Launch System (SLS) with an Orion human capsule on top, which may send mannequins around the Moon then splashdown back on Earth. NASA is now considering sending humans on that first mission.